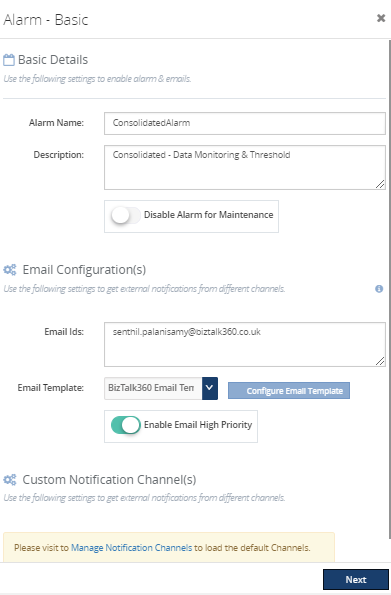 The first step in monitoring using BizTalk360 is to create Alarms. Alarms in BizTalk360 act like a package to associate things together. Example: You may want to monitor artifacts in few BizTalk applications together. Alarms help you to achieve this objective. 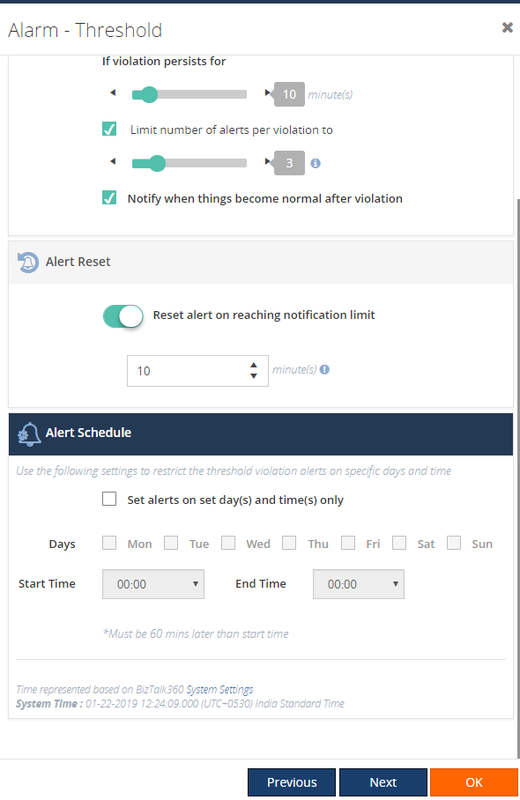 While creating the alarm, you can also configure how you want to receive the alerts, by configuring one or more of the available Notification channels, like e-mail, SMS, Slack, ServiceNow and so on. The Create Alarm screen is flexible; you can simply create a threshold alarm, a health check alarm or a data monitoring alarm. You can also consolidate all mentioned alarm types in the same alarm. Note: BizTalk360 has some limitation for the normal users. Only the super users can create, manage and monitor alarms and give access to normal users for monitoring dashboard. Threshold alarms in BizTalk360 can be set to send immediate (or based on configurable persist duration) alerts when a threshold condition is violated in the environment. If required, you can configure to monitor threshold violation only during specific times on days (say, weekdays between 0900 and 1700), which is useful if you wanted to monitor only during business hours. BizTalk360 can also be configured to notify you when the situation becomes normal. You can also limit the number of alerts that will be sent (otherwise you may end up in indefinite number of alerts being received for the same issue). There is an another powerful functionality available to reset the alarm once the specified notification limit is reached. For this example: In case a Threshold violation occurs on business days between 7:00 AM and 5:00 PM, which lasts for 20 minutes or more, John and Rachel from ACME need to be notified by email, with a maximum of 5 alerts per violation. When the maximum alert notification is reached, the alert will get reset after 10 minutes. It's one of the common practices in supporting a BizTalk environment for support people to maintain daily/weekly routine to take a look at the overall health status of BizTalk environment(s). BizTalk360 helps to automate that process by creating a daily health check/status alarm at set timing (ex: Mon-Fri, 9 AM). When you are creating an alarm, on the "Health Monitoring Alert" page, you can set up the alarms to monitor the health of the environment on a periodic basis. 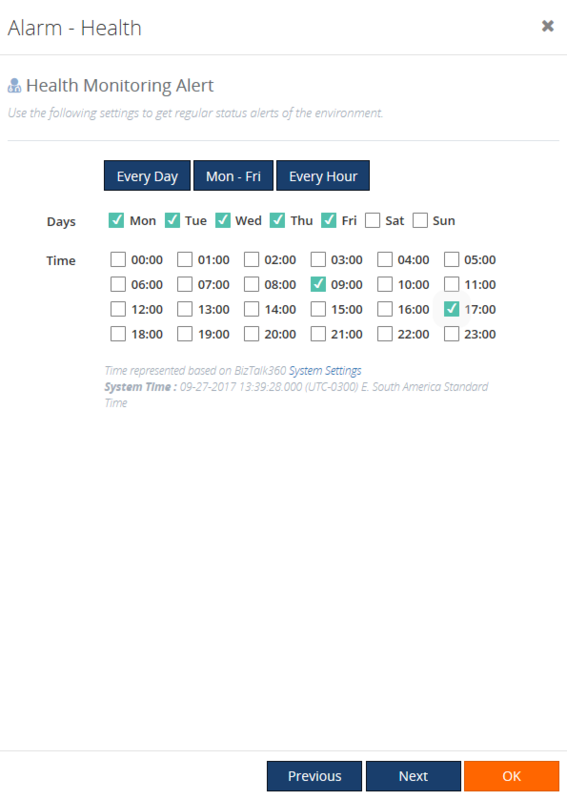 You can configure the days/times as per your convenience/requirement. For this example: Bob and Scott from ACME, need to receive Health status reports by email. They want to receive that report every business day at 8:00 AM and 8:00 PM. In BizTalk360, contains multiple query builders to, for example, query the message box database to search for running and suspended service instances. They can also use a query builder to look out for information about Tracked Service Instances and Tracked Message Events. Similarly, query builders exist to query BAM views, perform EDI activity search, and filter out the ESB exceptions. Besides manually querying, BizTalk360 also allows you to monitor on all these data points. 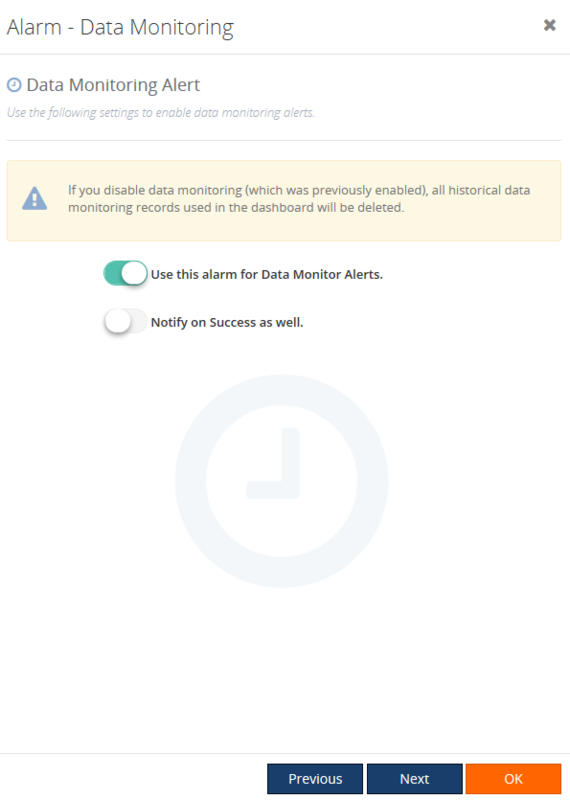 To be able to create data/activity related monitors, you need to create Data Monitoring alarms. For this example: John wants to receive alerts, based on non-events to happen. To achieve that, the first step is to create a Data Monitoring alarm. Create an alarm – Provide basic settings like name, email id’s, etc. The first 2 bullets are explained in the following sections. Adding mappings is described elsewhere. Email id - you can enter multiple email ids as comma separated values. Use commas separated email id(s) to send separate alerts to email ids (each mail delivered to a recipient is counted as a separate email count). Note: BizTalk360 uses the Azure Gateway for sending SMS messages. If you want to receive more than 5 (free) messages per day, you need to take a subscription to that gateway. 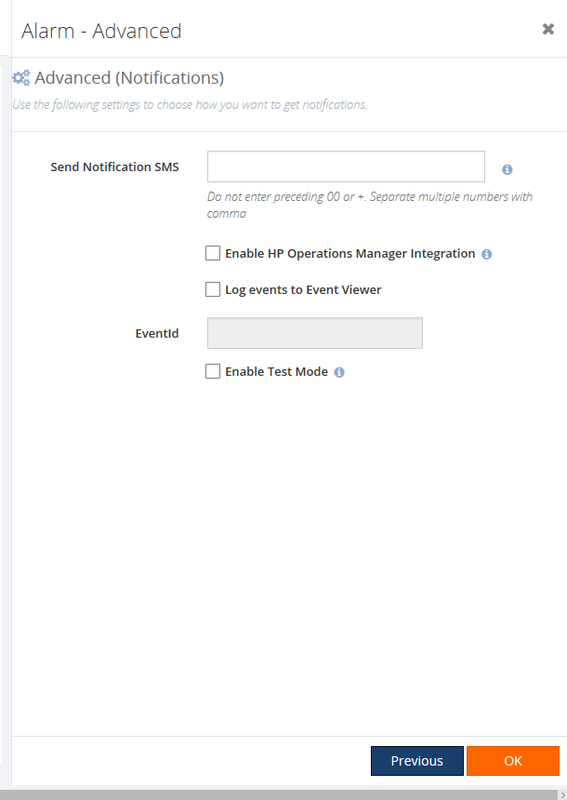 Log events to Event Viewer – Select if you want to write events from this alarm to the Event Log. If the Event Log option is enabled, Down and Up alert notifications are written to the BizTalk360 Monitor source in the Application Log. Violation Persist Duration — You can set the duration after which you want to receive notifications in case of a violation. Reset alert on reaching notification limit — You can use this setting, to reset the alarm. The counter will be reset after x minutes once the alert notification count is reached. The value can be set from a minimum of 1 mins to a maximum of 1440 mins. You can either click OK or Click Next to move to the last screen to add some Advanced Settings like SMS configuration, HPOM configuration etc.